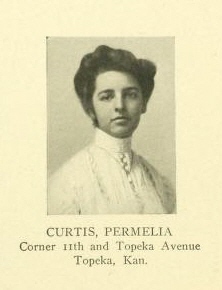 for 1 semeter in Topeka, Kansas; then graduated from Wellesley College in 1908. She was married to Charles Peasely George, 3 Jan 1914. She was a former Chairman of the Progam Committee of the Fort Sill Study Club. Her husband Brig. General Charles Peasely George died 31 Dec 1946.
reading, gardening, playing canasta or bridge. She had been visiting friends in Washington D.C.
to San Antonio, when she died 17 Oct 1955 in Tennesse; of a cerebral hemorrhage. She is buried next to her husband at San Antonio, Texas. All Web Site content © copyrighted WorldWide1998-2014 The information on this web site has been obtained from a variety of sources, including information from persons who did not identify their sources. Even where the original source is cited, transcription errors are common. All information should always be independently verified by the researcher, from primary source materials where possible.